We love throwing a sports themed party and these sports cookies will help make your birthday party festive and fun! 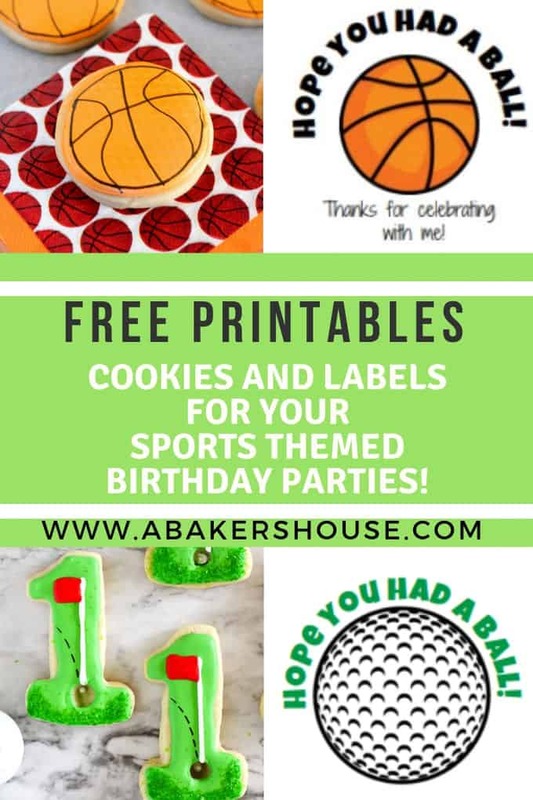 Whether you learn to make decorated cookies for a birthday, a team celebration, or to cheer on your favorite professional team, these cookies and free printable labels are a great place to start! 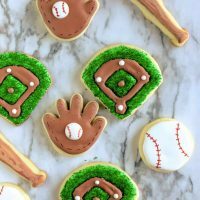 How do you make sports themed cookies? Bake cut out sugar cookies. Make royal icing. Color the icing if needed. Place cookies into plastic treat bags and print a sticker to turn the cookies into party favors! Decorated sugar cookies make beautiful party favors for your sports themed birthday party. Print labels for football, bowling, basketball, soccer and golf party favors from my Free Printables Library. 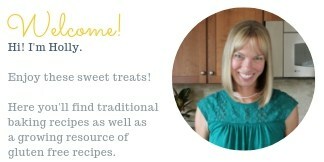 Access my FREE Printables Library by joining my mailing list. You’ll receive the password via email and will be able to download a sheet of 12 labels that you can print at home using a sticker sheet like this one from Avery Labels. These labels are perfect for party favors or to make your own thank you notes. 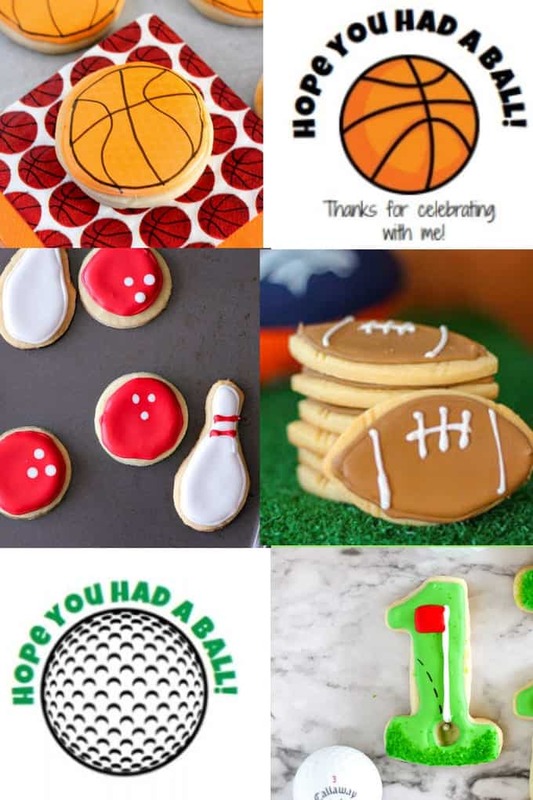 Celebrate a sports themed birthday party, your child's end of season team party or cheer on your favorite college or professional team with the best cookies for sports parties! Play ball with these cookies in the shape of baseball bats, gloves and baseball diamonds! Cheer on your football team with these football sugar cookies decorated with royal icing. 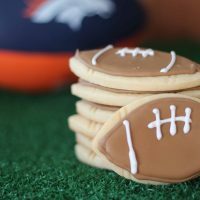 These decorated sugar cookies make for a perfect Super Bowl dessert! 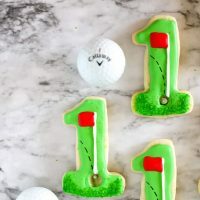 Celebrate a hole in one or make golf cookies for your favorite golfer with these cookies! 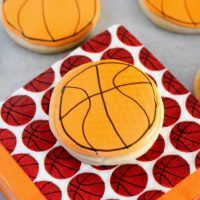 Cheer on your child's basketball team or your favorite college or professional NBA team with these basketball cookies! 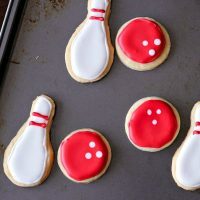 Bowling pin cookies and bowling ball cookies make a bowling celebration so much fun! Strike! 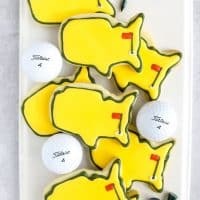 Are you hosting a Masters party this year? Watching the Masters golf tournament is an annual tradition. Make it a festive occasion with these decorated Masters golf cookies!